INTRODUCTION: Adam was invited by Pilar Bosley, the Chair of U.S. Figure Skating’s Athletes Advisory Committee, of which he is a second year member, to deliver a speech at the Athlete Alumni Dinner at Governing Council on May 2, 2015. Below is the text of his speech, which encapsulates his skating journey to date, in his own words. I am so honored to be speaking here at Governing Council tonight. I want to talk about my Olympic dream and what it means to me today. This past year has been a roller coaster. But I’ve learned so much about myself and would love to share my story. It is really special for me to be able to do this in front of people who I have known for most of my skating career. I am the oldest of 6 children. My mom is a single mother. I think my story is unique because my family has no sort of skating background, but here I am. I started skating right before my 10th birthday. I’m originally from Pennsylvania, where my family still lives, so every winter my mom would take us skating. I hated it every time. I would do two laps around the rink, which would take about an hour, and then beg my mom to buy me a soft pretzel and a hot chocolate. Something changed in the winter of 1999. Maybe it was the upcoming millennium? Whatever it was, this winter was different and I couldn’t be pulled off the ice. So much so that as a birthday gift, I was signed up for my local rink’s classes. Fast forward a few years: I would say the first time I felt I was actually getting close to my Olympic dream was when I won my first World Junior title [in 2008]. This validated all the hard work I had done to that point. It was the first time I think people didn’t think my mom was so crazy for having me live away from home for so many years, and I felt like it was the first time my dad actually realized that my skating wasn’t a hobby. I felt like I was actually chasing my dreams and I was on the right track. I won my second World Junior title the next year, and the year after that, I was an alternate to the Vancouver Olympic team, won my first Four Continents, and placed in the top 6 at the 2010 World Championships. I was going to ride this wave all the way to the podium in Sochi. In the first event of the post-Olympic season, which was the Japan Open, I won the men’s [free skate] event and beat out Evgeni Plushenko and Daisuke Takahashi. The next four years were mine and if anyone had anything to say about it, it was me. It was the first time I felt like I was a favorite to medal at my competitions. It was a completely different pressure and I felt like it was a responsibility to not let anyone down. I felt like if the results weren’t what I thought people expected of me, I had failed. When I would make a mistake in a competition, I would go home and wonder what was wrong with me. I felt like I wasn’t the same skater people were talking about before. I had so many doubts that I was dealing with and I felt embarrassed to talk about them to anyone. and be headed to my first Olympic Games. I was putting so much stress to be perfect at Nationals. I held on so tightly onto wanting that competition to go perfectly that, while I was skating, I could figuratively and literally feel it slip right between my fingers. The U.S. Championships in 2014 was the worst competitive experience of my life. I felt that I had worked my entire life for the opportunity to qualify for the Olympics and here I was. Four years after I had vowed that I would be on the team, I wasn’t going and was embarrassed about my performances. I remember turning to Rafael in the kiss and cry after my long program and knowing I blew it. I cried the next three days straight. The most important competition of my life had just happened and I was now watching so many of my friends getting ready to go to the Olympics and the realization hit me; I wasn’t going with them. All I had ever wanted was to be an Olympian, and because I wasn’t going, I felt like a failure. I felt like all the long hours my mom had driven me in the car were for nothing. I felt like all the hours on the ice were for nothing. I felt like all the sacrifices my family, friends, and coaches had made were all in vain. At this point, I was done. I wanted nothing to do with skating anymore. But the funny thing was, the more I tried to push skating away, the more I realized it became my therapy. It started slowly. I would go into the rink and skate five minutes and that would literally be all I could handle. But then the next day I would be able to skate a little more. And then the next, a little more. In those few minutes a day I would skate as fast as I could and feel the wind on my face and I felt happy. I was so devastated, and upset with myself, but just being on the ice made me feel happy. Being on the ice felt like home, I felt safe, I felt free and I felt like myself. What I wanted to do with my skating was a completely different story; I had no idea. I didn’t know if I was ready to go out and compete again. But then an opportunity came along. I was going to choreograph a short and long program for my friend and 2010 Olympian, Mirai Nagasu. I was so excited and honored to do programs for Mirai. In a way I couldn’t believe she actually trusted me to do them, but I was going to do the best job for her that I could do. And then my next opportunity came about; my friend Ashley Wagner asked me if I would choreograph her short program. Again, I was so taken aback that my friends trusted me to help put together their competitive programs. It was the first time since nationals that I felt good about being on the ice. I even wanted to be skating and training, too. I started getting back into my training. I started training my programs, I got ready for my competitions, but I was still unsure if competing was the right decision for me. Maybe I missed my time? Maybe my moment came and went and it was time to hang it up and move on? But I made up my mind, you only live once. I talked with Rafael and I told him that I wanted to skate the next season. This was really good news for Raf. All along he gave me my space while I was considering which path I should take, but he always had insinuated that he thought it wasn’t time to walk away yet. I was training full time, but I still kept asking myself, “Am I doing the right thing? Am I just going to look silly if I decide to still compete?” Well, as the Grand Prix season started, I skated like someone who wasn’t sure what they were doing. I skated like someone who wasn’t sure they wanted to be there. When my Grand Prix competitions were over, it was time to have a reality check with myself. I now had eight weeks before the U.S. Championships. I sat down with my coaches and trainer and told them that I was finally done doubting. I was done feeling embarrassed. I told them that since I decided to skate this season to the end, I was going to give to the end my entire being. I wasn’t going to hold anything back because at this point I had absolutely nothing to lose. I told myself that no matter the skates or placement I had at nationals, I was going to walk away from the competition proud. I was going to train the hardest I had ever trained and I was going to have no regrets. It didn’t matter what happened because I knew that what I was doing on the ice and off the ice, was everything that I had in me. It was finally time for nationals. Before my short program I had decided to watch the ladies’ short the day before. I watched my two friends skate their short programs beautifully. The programs I had choreographed were in 1st and 4th at the 2015 U.S. National Championships. As a first year choreographer, I was beaming with pride. I was inspired to compete. The next day was my short program and I knew I had nothing to lose, I was going to just go for it. I had a great short program but by the end of the night, I found myself in 5th place. Here I was, I had worked my absolute hardest and I was only 5th. It definitely wasn’t the place that I wanted or envisioned to be in. I took a moment and I remembered that I had told myself that I wasn’t going to let the results be a factor in how I was going to feel about myself by the end of the event. I was going to be proud of what I did that night no matter what, that by the end of that short program night, I was only going to focus on the long program two days later. I remember saying to basically anyone who would listen, “Just wait until my long program.” I was determined to put the kind of skate I do every day in practice out there. Once I hit the quad Lutz in the beginning of my long program, I took it all one step at a time. Each step was a step I had taken over a thousand times in practice. The only time I broke focus was in the last position of my last spin. I got off the ice and I got my score and it was great. It was the highest score for a free skate ever recorded at the U.S. Championships. I won the free skate and finished second overall. And even though I was second that night, I felt like a winner. I felt like a champion. It was in that moment that I realized that we train our whole lives for these moments. We train our lives for the moments when all of our hard work comes together and we can celebrate what we’ve done with the people who helped us get there. Our friends, family, and coaches have wanted it so badly for us and when it all comes together it’s a beautiful thing. It was in that moment that I realized that being an Olympian is more than going to the Olympics. That even if you’ve never competed in the Olympic Games, you can still compete with Olympic integrity. Long after you leave the ice arena, you will be remembered for the way you competed and treated others. From all of these experiences I can say, with an honest heart, that skating is a wonderful thing. I would not be who I am today without skating. It has introduced me to so many incredible people, people who have helped shape me into the person I am right here in front of you. Skating has taught me so many lessons that have carried over into my everyday life as well. I have learned to never give up and to never limit yourself. I have learned that there is no embarrassment in making mistakes and it’s how we react and deal with disappointments that make us champions. I have also learned that at the end of the day, you should always be proud of yourself. If you give something your all and you feel like you’ve done everything in your power to be able to show your best possible self, be proud of yourself. I have also learned that it takes a lot of courage to chase a dream. As an elite competitive skater, it is hard to learn these lessons in front of thousands of people, but falling down and getting back up is part of life. Always be grateful for the situations you find yourself in. They make us stronger and better. I am a big believer that when one door closes, another one opens. Always have an open mind, and an open heart, because you are capable of more than you could ever imagine, and your next opportunity is right around the corner. Adam filmed two video clips for U.S. Figure Skating’s GET UP campaign (launched on October 21, 2016): [WATCH CLIP 1] & [WATCH CLIP 2]. 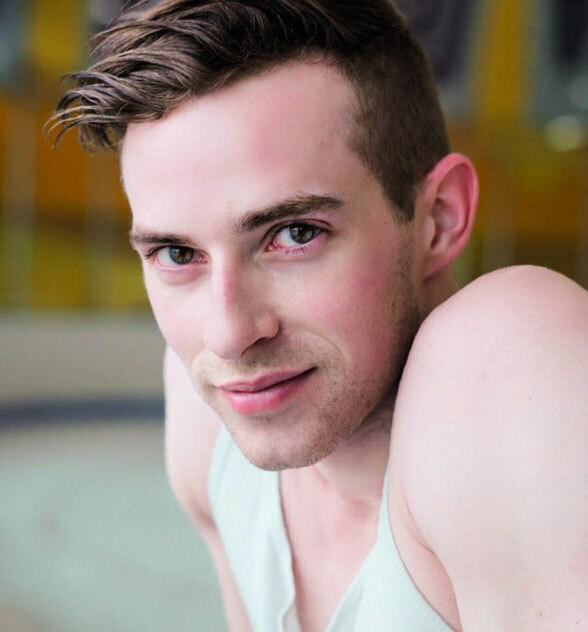 AdamRippon.com is written and produced by Adam Rippon in cooperation with Figure Skaters Online and the webmaster. Photographs are courtesy of Leah Adams and Getty Images.